Creating a green kitchen is a lot easier than you think! Now more than ever before, environmentally friendly products are becoming readily available. In fact, with such a wide array of options to choose from, many homeowners are opting to create kitchens that reduce their carbon footprint. Creating a kitchen that is kinder towards mother earth is easier than ever before. As it turns out, environmentally friendly materials can actually save you a ton of money in the long run. Here are just a few tips to take with you as you make your kitchen more green! While there aren’t many environmentally friendly cabinet materials available quite yet, using reclaimed wood is a good start. While reclaimed wood is not exactly a green material, it has the properties of natural materials. Opting for reclaimed wood is significantly less harmful to the environment than using other materials. Although you may need to put up some elbow grease to properly use reclaimed wood. In the end, it is well worth the effort. Therefore, looking for reclaimed wood for your cabinets can simultaneously look beautiful and be kind towards the environment. An essential element in every kitchen are the countertops. In fact, many countertops are created as focal points in kitchens in many homes. Therefore, using natural stone as your countertop material, like granite is a wonderful way to create a greener kitchen. In addition, other green materials such as recycled glass or plastic are wonderful options as well. There are a ton of trendy ways you can incorporate natural elements into your kitchen’s design. These days you have a wide array of options when it comes to environmentally friendly flooring materials. In fact, cork is becoming a very popular material in kitchens that are going green. 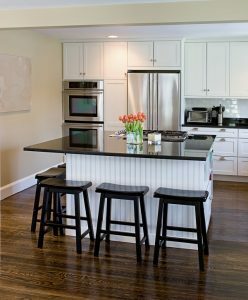 Due to improved engineering, many green materials are being produced as flooring options for homeowners looking to create an environmentally friendly kitchen. Rock Tops Fabrications uses the latest technology to ensure that your new home is designed, cut and finished exactly how you want it. We have over a decade of experience and have been constantly improving our services and offerings to meet the diverse needs of our customers. If you are in the Maryland, D.C., or Virginia area and looking for a beautiful new remodeled kitchen, give us a call at 410-363-4257. For more information and tips on making your home your own, follow us on social media at Twitter, Facebook, YouTube, Google+, Pinterest, and Houzz. This entry was posted on Friday, April 7th, 2017 at 8:28 am. Both comments and pings are currently closed.